This article is about the Village of Valley Forge, in southeastern Pennsylvania. For other uses, see Valley Forge (disambiguation). 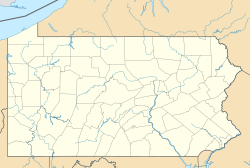 The Village of Valley Forge is an unincorporated settlement located on the west side of Valley Forge National Historical Park at the confluence of Valley Creek and the Schuylkill River in Pennsylvania, United States. The remaining village is in Schuylkill Township of Chester County, but once spanned Valley Creek into Montgomery County. The name Valley Forge is often used to refer to anywhere in the general vicinity of the park, and many places actually in King of Prussia, Trooper, Oaks, and other nearby communities will use the name, leading to some ambiguity on the actual location of the modern village. There is a partial re-creation of the historic village from the time of the American Revolution that is located next door, and just within the outskirts of the park. Valley Forge is known by travelers in the Philadelphia area as the westbound control city on Interstate 76 (the Schuylkill Expressway), as it is near where I-76 joins the Pennsylvania Turnpike. This remains, despite no exit being designated for Valley Forge, since the previous exit became the off-ramp to Mall Blvd., serving King of Prussia. Valley Forge is mostly known for the lending of its name to the encampment of George Washington's Continental Army during the winter of 1777 to 1778. This page was last edited on 31 January 2019, at 17:54 (UTC).